Home » CBC » 2018 CBC - The Results are IN! 2018 CBC - The Results are IN! 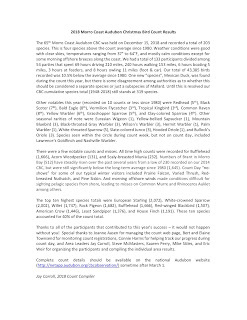 The 65th Morro Coast Audubon CBC was held on December 15, 2018 and recorded a total of 203 species. This is four species above the count average since 1980. Weather conditions were good with clear skies, temperatures ranging from 37° to 64°F, and mostly calm conditions except for some morning offshore breezes along the coast. We had a total of 133 participants divided among 54 parties that spent 69 hours driving 210 miles, 240 hours walking 153 miles, 6 hours boating 5 miles, 3 hours at feeders, and 8 hours owling 11 miles (foot & car). Our total of 43,385 birds recorded was 10.5% below the average since 1980. One new “species”, Mexican Duck, was found during the count this year, but there is some disagreement among authorities as to whether this should be considered a separate species or just a subspecies of Mallard. Until this is resolved our CBC cumulative species total (1948-2018) still stands at 319 species. Other notables this year (recorded on 10 counts or less since 1980) were Redhead (5th), Black Scoter (7th), Bald Eagle (8th), Vermilion Flycatcher (3rd), Tropical Kingbird (3rd), Common Raven (8th), Yellow Warbler (6th), Grasshopper Sparrow (5th), and Clay-colored Sparrow (4th). Other seasonal rarities of note were Eurasian Wigeon (1), Yellow-bellied Sapsucker (1), Mountain Bluebird (3), Black-throated Gray Warbler (3), Wilson’s Warbler (3), Hermit Warbler (1), Palm Warbler (1), White-throated Sparrow (5), Slate-colored Junco (3), Hooded Oriole (1), and Bullock’s Oriole (3). Species seen within the circle during count week, but not on count day, included Lawrence’s Goldfinch and Nashville Warbler. There were a few notable counts and misses. All time high counts were recorded for Bufflehead (1,666), Acorn Woodpecker (131), and Scaly-breasted Munia (232). Numbers of Brant in Morro Bay (512) have steadily risen over the past several years from a low of 230 recorded on our 2014 CBC, but were still significantly below the long-term average since 1980 (1,645). Count Day “no-shows” for some of our typical winter visitors included Prairie Falcon, Varied Thrush, Red-breasted Nuthatch, and Pine Siskin. And morning offshore winds made conditions difficult for sighting pelagic species from shore, leading to misses on Common Murre and Rhinoceros Auklet among others. 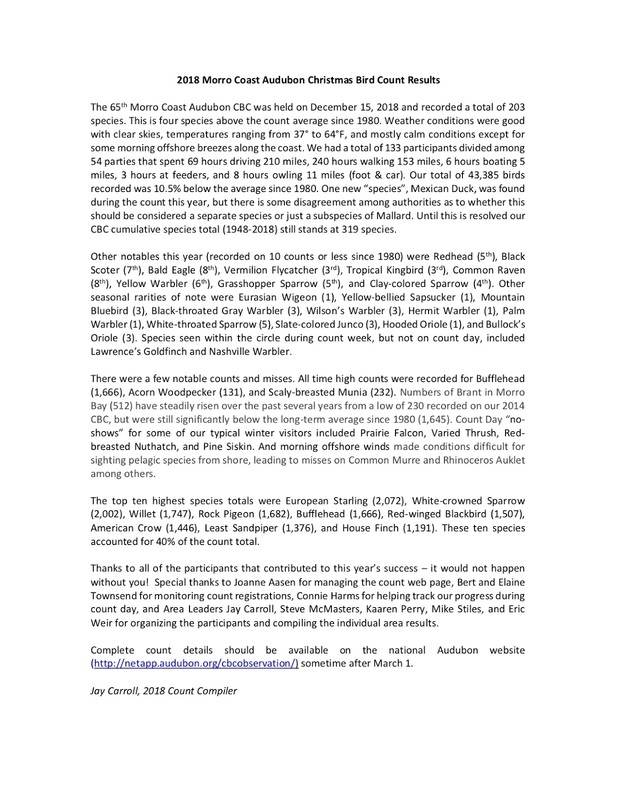 The top ten highest species totals were European Starling (2,072), White-crowned Sparrow (2,002), Willet (1,747), Rock Pigeon (1,682), Bufflehead (1,666), Red-winged Blackbird (1,507), American Crow (1,446), Least Sandpiper (1,376), and House Finch (1,191). These ten species accounted for 40% of the count total. Thanks to all of the participants that contributed to this year’s success – it would not happen without you! Special thanks to Joanne Aasen for managing the count web page, Bert and Elaine Townsend for monitoring count registrations, Connie Harms for helping track our progress during count day, and Area Leaders Jay Carroll, Steve McMasters, Kaaren Perry, Mike Stiles, and Eric Weir for organizing the participants and compiling the individual area results. Complete count details should be available on the national Audubon website (http://netapp.audubon.org/cbcobservation/) sometime after March 1.